Earth must have felt pretty inadequate a week or two ago when astronomers announced that distant Pluto has yet another moon. Pluto! Recently demoted to a dwarf planet! And yet it boosted its satellite total to four, while we remain forever stuck at one. True, Earth is ahead of Mercury and Venus, which have no moons at all. But Mars, which is significantly smaller than Earth, has two; and don't even mention Jupiter, with more than 60; or Saturn, with 53. Even asteroids have multiple moons  including Sylvia, a 384-mile (617 km) space rock that boasts the twin satellites Romulus and Remus. But Earth's rep may might gotten a bump, thanks to a paper just published in the journal Nature. Our home planet may have just one lonely moon now, but long ago, like Mars and Sylvia, we had two. "Whether it's right or not, I don't know," says Maria Zuber, a planetary scientist at MIT who wrote an opinion piece accompanying the new study. "But I think it's very plausible." 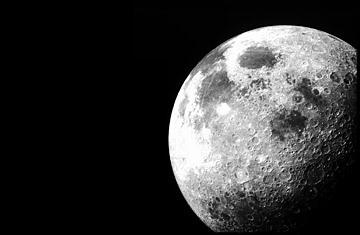 The idea, cooked up by astronomers Martin Jutzi and Erik Asphaug, of the University of California at Santa Cruz, started out as an attempt to explain why our moon has so asymmetrical a surface. The part that faces us is relatively smooth, with vast expanses of ancient lava forming flat, dark, low-lying plains that earlier astronomers mistook for oceans. But when space probes first circled the moon in the early 1960s, scientists learned that the far side is mostly covered with rugged mountains and craters. Nobody has ever been able to explain with certainty why the moon should be so lopsided: maybe it had to do with some kind of massive impact that violently rearranged the surface, much like what happened to the asteroid Vesta. Maybe it was a slightly off-center core that caused the crust to be thinner on the Earth-facing half of the moon, which made that hemisphere more susceptible to lava bleeds. But then Jutzi and Asphaug began thinking. "It looked to us a little bit as though the highlands on the far side accreted"  which is to say, they were added on top of the pre-existing surface. The astronomers thought a bit more, and realized that this idea was consistent with scientists' beliefs about how the moon formed in the first place. Thanks to the analysis of moon rocks that were brought back by the Apollo missions, planetary scientists are pretty sure that our satellite was born billions of years ago when a Mars-size planetoid smashed into the young Earth. The impact blasted off a cloud of debris from both of the objects and sent it spinning into space, where it eventually congealed into the moon. There could have been other, smaller pieces as well, says Zuber, but their orbits would have been unstable, causing them either to be flung away or to fall into Earth or the moon pretty much immediately. Except, that is, if they happened to end up at a Trojan point  a place in the same orbit as the moon, but either well ahead of or well behind it, that's gravitationally stable  or relatively so anyway. Just last week, astronomers announced the discovery of a Trojan asteroid leading the planet Earth around the sun. There's no reason a Trojan moon couldn't lead or follow our moon around the Earth. Read about one librarian's quest to locate American flags on the moon.